Well, if you had Miguel Montero to the Red Sox by 2013 in your pool, while you’re not totally out of the running, the possibilities of that happening took a really bad hit on Saturday. As hope for by many, the Arizona Diamondbacks have signed catcher Miguel Montero (2002-03) to a five-year contract extension, which will kick in next season and pay him, on average, the $12 million per that his agents were reportedly looking for in a deal. While there are some people who are skeptical about the signing, there is a group who is all for it – the D-backs pitching staff. – The closest catcher to Montero, skills-wise, in the minor-league system is … no one. And that’s not a knock on all of our former Osprey catchers still in the system. There’s just not one guy who possesses ALL of the tools that Montero brings to the table. With it still being too early to judge on Michael Perez – the 5th-round pick from 2011 who is targeted for Missoula this season – the closest thing to Montero’s all-around abilities (from a former Osprey standpoint, that is…) is a mix between Rossmel Perez (2008) and Raywilly Gomez (2009), or a guy like Roidany Aguila (2009-10-11), who improved greatly in 2011 but has struggled at the plate for South Bend. Yet, he has the most starts among Silver Hawks catchers behind the plate (23) this season. The bottom line is, Perez is probably, among former Osprey, anyway, next on the list. Unless Perez puts up eye-popping numbers at the plate, and can be solid defensively, then there is that chance of having someone with all of the tools whom the D-backs have confidence to bring into the fold. Konrad Schmidt is seen as good at the plate, needs work behind it. With the guys like Montero, it’s the reverse that helps you stick in the Major Leagues. – Who else would be out there?? The D-backs discovered that the catching pool is about as shallow as fountain pool – you can stand in it, you may get lucky, but the best you can expect is a handful of pennies and a citation from the cop watching you wade in from a distance. In other words – it’s fool’s gold, compared to what they have in Montero. – And, last but not least, these numbers to consider: Among NL backstops since 2009, Montero ranks first with 92 doubles, second with 178 runs scored, 209 RBI, .452 slugging percentage, third with a .280 average, 378 hits, 611 total bases, 45 home runs and an .800 OPS, fourth with 391 games and a .348 on-base percentage and sixth with 131 walks. He has excelled in the clutch with 41 go-ahead RBI and 25 game-winning RBI, both second-best in the NL. Defensively among active NL catchers since 2010, he is second to the Cardinals’ Yadier Molina by throwing out 33.7 percent of attempted basestealers (54-of-160). In other words – the D-backs looked around, discovered they had the best dance partner and have decided to stick with ’em. Oh, and one more thing … Kevin Towers is about as smart as they come, and he wants quality people around. So .. it turned out to be easier than we all thought it would be to keep him. – The D-backs want Gerardo Parra (2006) to tone down a bit on the bases, yet stay aggressive. This came to light after he was picked off in a key spot in Saturday’s game with the Milwaukee Brewers. – Paul Goldschmidt (2009) really “squashed the bug” – planted his front foot and turned on it – when he hit a long home run to center field in the D-backs’ win on Sunday at Chase Field. Let’s hope he squashes a few more this season, eh?? The Arizona Diamondbacks will announce at 6:30 p.m. MT that they have reached an agreement on a five-year contract extension with catcher Miguel Montero (2002-03 Osprey). Details were not revealed by the club, but FoxSports.com reports the deal to be in the $60 million range. Be looking for more information shortly on this story. Next to any extended weekend … wait, what is a weekend, anyway?? … this is my favorite weekend of the year. You may be wondering just why that is, but while it’s important we take time to reflect on those who paid the ultimate sacrifice so that we can continue to enjoy the freedoms that we do, that’s not the reason. Although it gives us a longer weekend, so the Memorial Day holiday does indirectly become a reason for why I love this weekend so much. The real reason – it’s the first weekend of the Osprey season for me. This is the weekend in which yours truly will spend most of in his broadcast booth or in other spots of the press box, working on the club’s (and now the league’s) record book, figuring out radio script for the season, and just generally prepping while baseball is happening on the field. 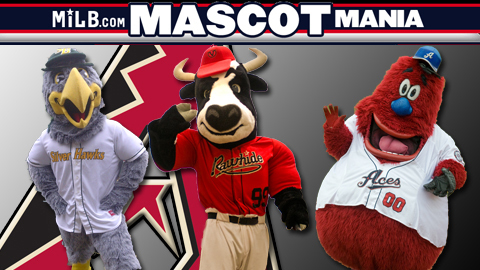 As you may know, our own Ollie Osprey is among the final 64 candidates for Mascot Mania, an event put on by MiLB.com which is meant to determine, by fan vote, who is the best mascot in all of minor league baseball. Ollie was pleased to be a part of the field, and felt like Montana men’s basketball, when he essentially received, according to The Dude from Corridor fame, a No. 13 seed in the West region. He’s paired up with Cosmo, the mascot for the Triple-A Las Vegas 51s. So, how do you beat Vegas? Well, we asked around. We asked people in the know … successful card players, people who love slot machines, card dealers and, last but not least, pit bosses. Their response … no comment. So we tried everything. Then we talked to members of the Osprey front office. They had their own theories. 1. Get your friends to be involved. Often. You can stuff the ballot box, so go for it!! 3. Ask our Osprey Nation members on both Facebook and Twitter to spread the word and do the same thing. First-round voting goes through May 29, so get to networking people!!! Every year, it seems to be a different guy we love to feature on Bird Droppings. Last season (OK, keeping in mind that we only started to do this full-bore last March, but still …), it was Paul Goldschmidt (2009 Osprey), who hit his second home run of the season this past weekend, and could be one of those guys who help the D-backs to a NL West repeat. This season, we have moved from the Goldy Watch (because it was a matter of when, not if, he was getting a call-up to the D-backs), to EatonMania. – Well, the D-backs picked up a nice win tonight in a game where a pair of former Osprey delivered big hits. Paul Goldschmidt (2009) ignited the D-backs 3-run top of the eighth, while Scott Hairston (2001) also delivered a two-run, game-tying double for the New York Mets. In fact, every former Osprey who had an at-bat in the game had a hit. – Speaking of one of them, Miguel Montero (2002-03), we came across a great story on him from Fox Sports writer Ken Rosenthal on Montero. It goes into the background on how Miggy started his road from Venezuela to the Major Leagues, by way of Missoula, of course. Which reminds me – the D-backs are on Fox tomorrow, one of the games to be featured across the country. – One more little bit of Fox … this fantasy update has CarGo at the top of the list. Carlos Gonzalez (2003) is indeed starting to heat up, which is good for former Osprey followers, the Colorado Rockies and fantasy baseball players.